Xolo recently launched its new Phablet Xolo Q2000 (Quick Review) priced at a moderate MRP of 14,999 and this constitutes a good option for those looking for that extra screen real estate at this price range. LG also recently launched LG G Pro Lite (Quick Review), a trimmed down variant of its last flagship Phablet and this phone with the brand name of LG, has also been designed for those who prefer a bigger screen. Let’s put both of these phones head to head to know which one is a better option. LG G Pro Lite has body dimensions or 150.2 x 76.9 x 9.4 mm which implies that it is slightly sleeker than 156 x 77.8 x 9.8 mm Xolo Q2000. Also it Weigh 160 grams which is significantly less than Xolo Q2000 weighing 180 grams. Both of these phones are not heavy considering their display size but LG G Pro lite will be more comfortable to hold. Both of these smartphones come with a 5.5 Inch IPS LCD display but Xolo Q2000 comes with better resolution. The Xolo Q2000 sports a 5.5 Inch display with 1280 x 720 pixel HD resolution which amounts to 264 pixels per inches and the LG G Pro Lite on the other hands has 960 x540 qHD resolution which amounts to 200 ppi. Will this difference be distinguishable to human eyes? The answer is yes. On a large display their will be a difference and the texts and images won’t be as crisp on LG G Pro Lite. The Xolo Q2000 is powered by MT6589W chipset with 1.2 GHz Quad core processor and PowerVR SGX 544 MP GPU clocked at 357 MHz according to Xolo. This processor is based on Cortex A7 architecture which is power efficient and comparatively new architecture than Cortex A9. The LG G Pro Lite will have a 1 GHz Dual core cortex A9 Architecture based processor from the same manufacturer, MediaTek. The GPU is PowerVR SGX531. This MT6577 chipset will perform well in Apps where only two cores will be used, but for more intensive usage, Xolo Q2000 will be a much better option. Overall Xolo Q2000 houses more processing power. The Xolo Q2000 has a 13 MP Auto focus camera at the back with BSI sensor and Support for Full HD Video recording at 30 fps. A secondary camera of 2 MP is also present for video calling. The Primary camera in LG G Pro Lite has a smaller 8 MP camera with LED flash support. This camera is also capable of Full HD 1080p Video recording at 30 fps. Front camera of 1.3 MP is also present for video calling. The camera performance is more dependent on ISO rather than MP count, which you need for more details and effective zooming of photos when you transfer them to larger displays. Because of the BSI 2 sensor we expect the camera performance to be better in Xolo 2000 under low light conditions. The RAM capacity is 1 GB in both of these phablets and there is nothing to choose from in internal storage department either. Both of these Phablet will provide you with 8 GB of onboard storage and microSD support up to 32 GB. The Battery capacity of Xolo Q2000 is 2600 mAh and this will provide you up to 17 hours of Talk time and 520 hours of standby time. The LG G Pro Lite comes with 3140 mAh battery which is much appreciated feature in big display phablets for better enjoyment of the large screen real estate. This battery will also provide you with 845 hours of talk time and 14 hours and 30 minutes of talk time. 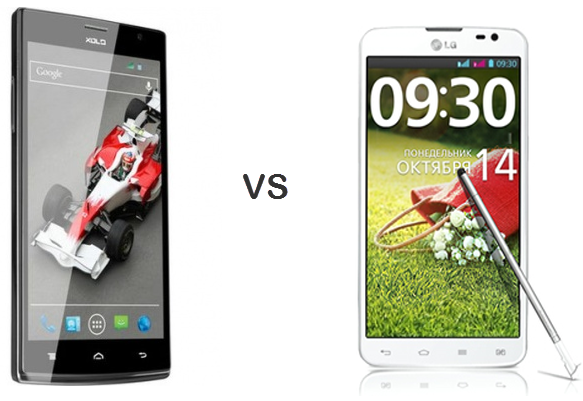 Both of these phones are Dual SIM phones and run on Android jelly bean operating system. The LG G Pro Lite has advantage of a stylus. This will appeal more to those who desire Stylus functionality to take full advantage of large screen display. Xolo Q2000 has better specifications on paper. It comes with better display and a better processor which are very necessary for apt smartphone experience. LG G Pro Lite will give you advantage of stylus and a bigger battery, but you will have to shell out around Rs. 4,000 more. Xolo Q2000 Is no slouch in battery department considering Xolo’s official claims. LG G Pro Lite has another advantage that it comes with the Brand name of LG which also means better after sales services.